By Yessenia Ojeda. Building a roof garden was no easy task. From lengthy tasks of propagating plants to building and transporting modules to planting and to hoping that our plants will survive. Today I wasn’t on our last class meeting I saw the meteorological equipment for the monitoring of different aspects of the atmosphere around the roof garden. 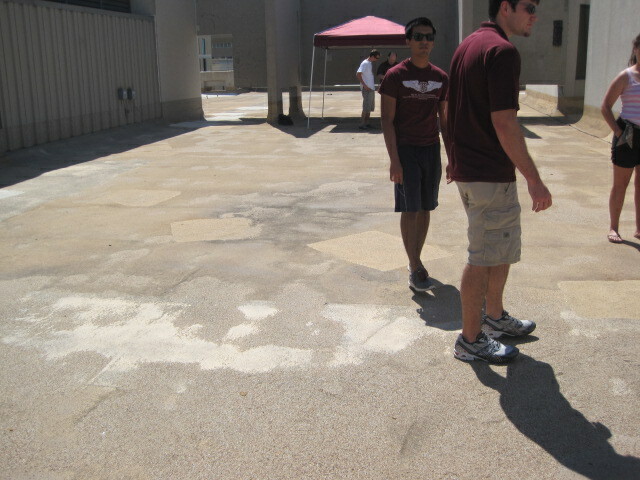 Although, I wasn’t there to see this go I up, it is one of the last steps in concluding the building of the green roof. All that is left to do is test the sprinkler system, in order to ensure our plants are maintained when we are on break and ensure they are well established. As a student of the landscape architecture department, I don’t know much yet in terms of plants or of the various technologies surrounding green roofs, but this project has brought me that much closer to becoming familiar with them. Here are some photos of the running sprinkler system. By Yessenia Ojeda. We spotted one of the first butterflies of the tons we hope to attract through the roof garden. My first year here at A&M as I was getting introduced to the landscape architecture profession, we had Professor Dvorak as a guest speaker and I remember that he came to talk to us about projects such as green roofs and that he was currently doing research right on top of our building, Langford. I immediately taught that this is something I would like to get involved with. Two years later, I am on top of Langford, taking pictures of him chasing butterflies. It has been a great journey and hopefully I can get involved in the next step, the living vertical wall. We also looked at water potential. Water potential is the amount of energy required by the plant to absorb water. The less water in the media, the harder it is for the plant to absorb the water. Plant stress can be triggered by water potential. This number varies a lot between different plants. The initial probe (GS3) was checking the water content and the second probe (MPS-2) was checking the water potential. Water potential content began to drop rapidly at around 10%. At around 9% it passed -1500 kPa which is when the average plant will become stressed. Most of the plants we are using are more resistant to negative water potential, but because after 10% there is such a rapid decline, it is still important to know when the rapid decrease begins. Nancy Luong and I represented the green roofing team at the annual horticulture research presentation. It was a rewarding experience, as I have not had much experience with research presentation and interpretation. With the help of Dr. Volder, we were able to write out and present all of our research thus far. It was a bit unnerving to be the only undergrads at the presentation, but we kept our nerves in check. Doing this sort of work made me realize that I wouldn’t mind continuing my education in a research-oriented route. Prior to this I thought it would just be tedious and painful, but it really was rewarding. With the semester coming to a close we’ll have to see where this newly found interest will take me. The green roofing project hasn’t just consisted of propagating, setting up modules and installing everything on the roof. 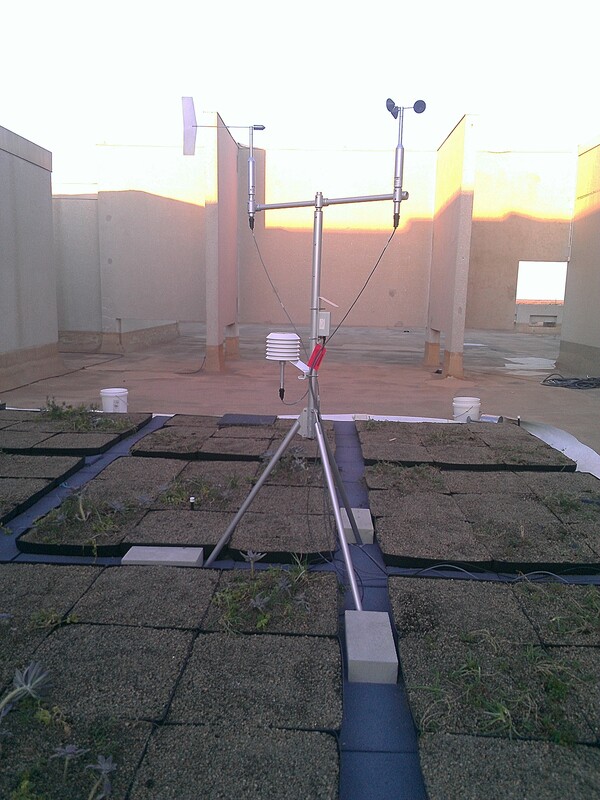 This semester we have also been testing the media we’re placing the plants in and the probes that will be used on the roof to record data on the soil. Throughout the semester a group of students have been going to the lab, taking samples of the media and placing it in crucibles, and measuring their weights. After they take the initial measurements they stick the crucibles in the decimator. Once a week we would take out all the crucibles we put in that week and measure their weight again. This weight will be the weight without moisture. Once we know both weights, we can say both how much water the media had in it and how accurate the probes were. There was a strong positive correlation between the indicated by the blue line. The 1:1 line was in grey and is what we expected from the results. A majority of the error we had was based on two factors: crucible size and human error. 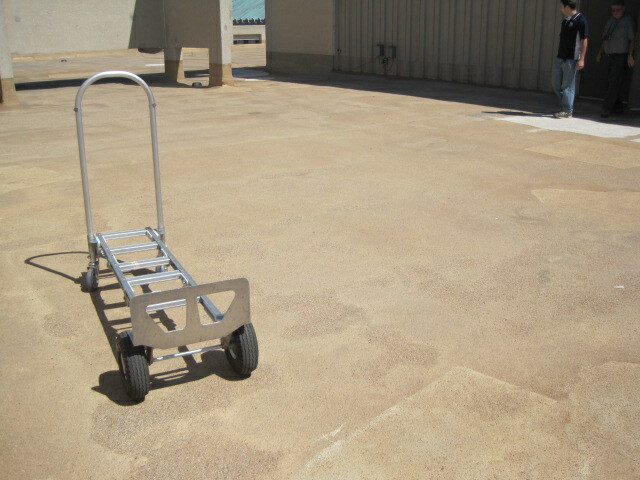 The media we are using for the green roof has extremely variable particle size. Because some of these particles were rather large, the crucible size was too small. If we had increased the size of the crucible, we would have been measuring more soil each time and would have had more accurate readings. The human error isn’t any one thing in particular. There were a lot of people taking measurements. There is always the possibility that someone mixed up samples, lost some of the soil, used different techniques which resulted in different numbers. Whatever the reason, it was clear that some of the inaccuracy was our fault. Although we could have done better, it was clear that the probes readings were more accurate than ours. This is a good thing. We will grow as researchers from our mistakes. Book knowledge is important, but action and execution are also important. You have to apply your knowledge to see what you really know. This was a great opportunity to do just that. We started out with nothing but a bare roof and a green house full of plants. 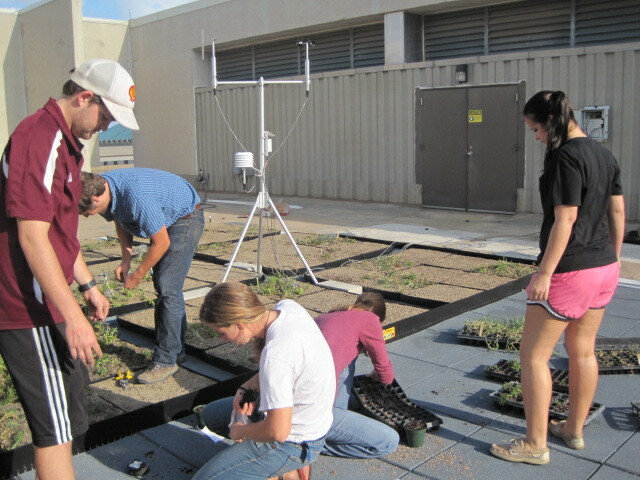 We now have Texas A&M University’s first true green roof. I would like to thank all of the students and professors for a productive and successful semester. Thanks to all the students for being patient with us as we were also learning during the first semester of the project. I realize that some of the tasks we completed were quite labor intensive and not ones that you expected to be asked to do when signing up for the course. This could not have been done without the efforts of each and every one of you. This semester is finally coming to a close as we all prepare for the last of our finals. Looking back, signing up for the Green Roof Project has been one of the best decisions I could have made this semester. Aside from learning more about green roofs, I have had the opportunity to expand my knowledge in meteorology, horticulture, and landscape architecture. I’ve learned that some of the plants we are planting are dormant, not dead (could have fooled me)! I have also had the pleasure of working with students outside of my major and have seen first hand how they apply their knowledge to the project. I have gained valuable experience in working with other students and together coming up with solutions to problems faced along the way. From the meteorological aspect, I have enjoyed learning about the various interments and how they work and are set up. I look forward to continuing on this project next semester and hopefully will gain experience with programming the different instruments. As seen in the photo above, the tripod with the various instruments has been our biggest success. Wiring all of the instruments to the data logger mounted on the wall was a big learning experience in understanding how instruments “talk” to the computer. Dr. Conlee is truly one of the best professors at Texas A&M. Him, Dr. Dvorak, and graduate student, Kirk Laminack have really taken charge of this project and provided a great learning opportunity and environment for students. Without them, I would not have had the wonderful opportunity to be apart of this project and look forward to working with each of them next semester as they have all taught me so much! 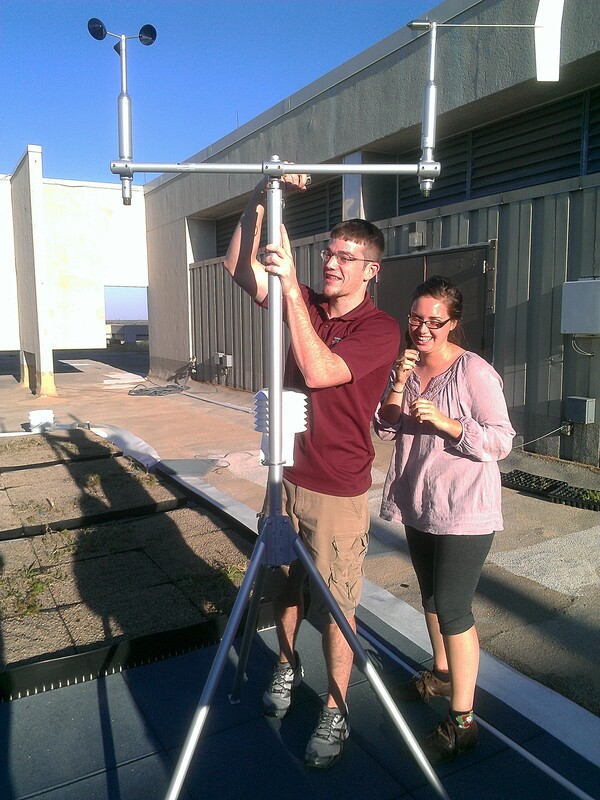 Erik Nielsen and Hannah Upton mounting on various instruments to the tripod. How will our roof affect runoff? 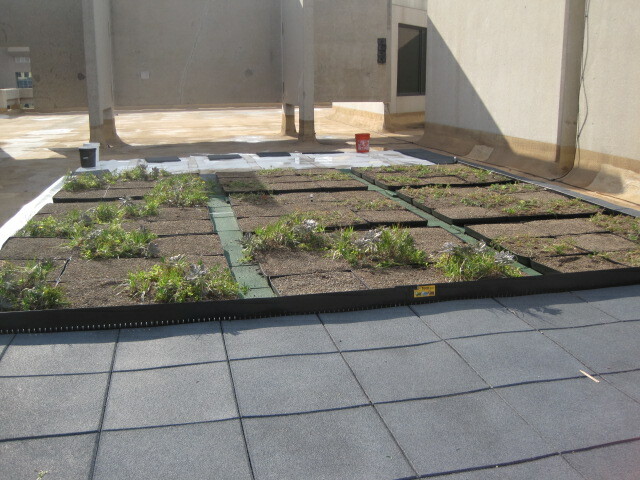 We have been planting the green roof for over a month now. It is time consuming because each module has a different species composition. We have four different combinations of plants, and they are planted in a different order in each module. Planting the different roof compositions reminded me of a study I read called “Influence of vegetation composition on runoff in two simulated green roof experiments” published in Urban Ecosystems in 2008. 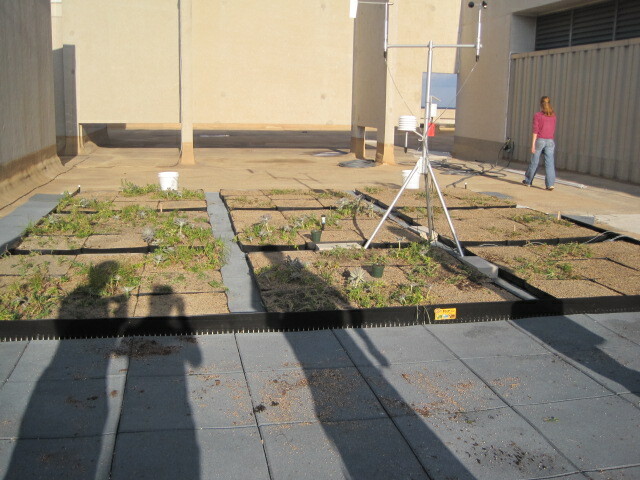 The study found that things like plant height and structure influenced the amount of storm runoff on a green roof. Decreasing runoff is one of the many benefits of a green roof because it helps prevent flooding after a heavy rain. The study addressed the question of whether all green roof provide the same benefits, and concluded that they do not, and that taller vegetation with broad leaves are better at retaining runoff. I wondered how our vegetation might perform. Instead of setting up a runoff study, I wrote down if the plants are more “upright” or “creeping” and just hypothesized about how they might do. Roof 1 has four upright plants and one creeping plant. I think it may be the best at retaining runoff. Roof 2 has one creeping and two upright plants. Roofs 3 and 4 each have two creeping and four upright plants. Each of these roofs has the same ratio of creeping to upright, so I theorize that they will do about the same, but not as well as roof one, at retaining runoff. If the plants end up growing sparsely or vigorously it will affect how well they retain runoff, and there is more to plant structure than just upright or creeping stature. I was also unsure if we are using an upright or trailing variety for several species, and that will also affect how accurate my conclusion is. Maybe, in the future, a customer installing a green roof here in Texas could include runoff capabilities and other differences in performance in the factors that help them decide what they want the species composition on the green roof to be. We’ve been planting different species on the green roof for the past month, which we will use to determine what grows well and provides the most benefits for green roofs in our climate. The species we chose to plant are limited not only by heat and rainfall but by the thinness of the substrate we’re using. Using just a few inches of substrate is an important part of the experiment because many people who are want a green roof cannot afford the higher cost of using deeper soil, and most buildings cannot handle the added weight. Unfortunately this limits the number of species that will grow on the roof. One benefit that a green roof can provide is increased habitat for native plants and animals, and while I was planting I began wondering how that benefit can be preserved in the thin, dry soil of an extensive green roof high up on top of a skyscraper. I decided to read some articles on the issue. First I read an article on green roof habitats in Sweden that recommended using local natural soil to encourage arthropods to live there, but this causes a problem because native topsoil can be too heavy and have poor drainage. The article went on to say that, even with the deep substrates found in intensive green roofs, most local animals can’t survive on a roof because it is too hot and dry. It specifically mentioned earthworms, who bury themselves deep in the soil when it is hot out, but cannot bury themselves deep enough in a green roof. Other animals simply have trouble getting up that high, even if they could live up there easily. It was an interesting article, and stressed that although green roofs form an important habitat that would otherwise not be there, there is still room for improvement. Next I found a study similar to the one we are going to do on our green roof, but in Berlin instead of College Station. They also used different substrate compositions to see how it affected plant vigor. Berlin is much cooler than Texas, but it doesn’t rain much, so drought is a problem for both Texas and Berlin green roofs. Since the substrate was only 10 cm deep, it is similar to the depth of substrate we are using. The study found that certain species grew better than others, and that all species grew significantly better when the substrate was mixed with superabsorbent polymers (SAP). The polymers retain water much better than expanded slate mixed with organic matter, and the plants had water access even after months without rain. From this, I determined that the plant diversity of a green roof could be expanded if a little SAP was added, because plants that ordinarily could not withstand the dryness of an unirrigated green roof might be able to if they had longer access to water during periods without rainfall. However, I don’t know how much it costs to add SAP. It might be too expensive, but on the other hand it might not be too expensive for everyone, and better plant growth keeps the roof prettier, which is an important consideration. Finally I found an extensive retrofitted green roof in the UK built with special consideration for endangered local fauna. Despite being 160m tall and using crushed bricks as substrate, it quickly became home to grasshoppers and ladybugs, and hopefully in the future ground nesting birds will live there, too. It’s no nature reserve, but it’s still a very inspiring tale. After propagating plants, setting up the membrane layer, and moving the modules into place; it was finally time to put plants in the ground. While we had originally wanted to get plants in the ground before the first cold front, we simply did not have the plant numbers to make that happen. They needed a little more time and a little more encouragement. However, thanks to the lovely Texas weather we got notice in late November that it was time to get our hands dirty! Unfortunately my hands were too dirty and I was unable to take any picture of us actually putting plants in the ground because I was afraid it would mess up my phone and I was too focused on making sure that our plants got in the ground in a timely manner. The first picture is a picture I took of my finished module. It has various succulents mixed into it and will hopefully benefit the most by being up on the roof for the next several months. I am hoping that all of the plants we put in the ground prosper because I am hoping that this experiment will lead to Texas A&M implementing green roofs into their design for future buildings on campus. Today is Sunday, December 2nd. This marks the beginning of the last week of classes for the semester. It also marks the beginning of the last week of the green roof project for 2012. Obviously, there are mixed emotions about this, but I feel like they largely stem from the fact that at this point we haven’t completed quite as much of the green roof as we assumed we would. As of this week, not all of the modules have been planted. Considering the nature of a “green roof” project, this feels slightly problematic to the overall success of the project, and there may have been some slight frustration about this last week. However, we can’t forget that we actually have accomplished so much of a flagship project, and this accomplishment is worth our attention. We propagated plants, set up roof protection tiles, built modules, began planting, and installed irrigation all within the limitations of trying to match everyone’s changing weekly schedules. We all learned a significant amount about the process of building a green roof and about how different disciplines of study come together to complete such a project. We even had fun. And if that isn’t worth it, we might finish our planting in the next two weeks – in enough time to call the project “finished” and “a success”. On a more philosophical note, the fact that we aren’t quite done with what we had planned to complete during this semester alludes to a larger concept of progress. 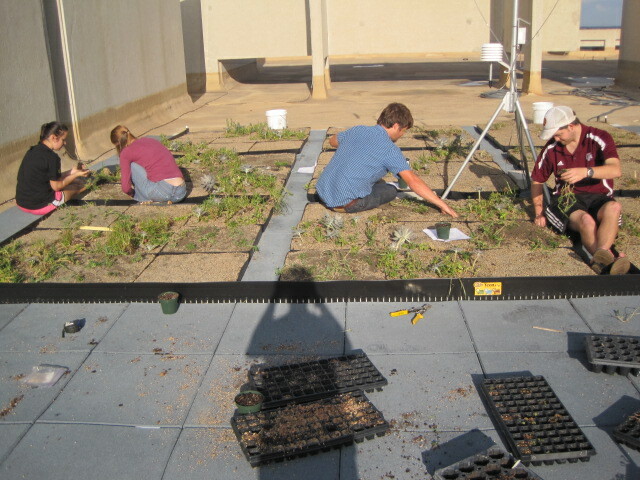 Once we finish planting, the green roof project still cannot be considered “finished”. The green roof is never “over”. The plants will still require attention; the irrigation system will still need to be monitored and manipulated; the roof will still need to be visited in order to be beneficial to the education of students. Data will be collected and analyzed; the source of that data will need to be protected and prolonged over time. The green roof project will not end. The need for the green roof project in education will not end. The need for the green roof concept in development will not end. The need for people with experience like we have gained by taking part in this project will not go away. For these reasons, I am thankful. It makes me enthusiastic about continuing to work on the project and on future projects that are similar to it. I hope that students and faculty share this sentiment and will pass it on to those involved with the project in the future. 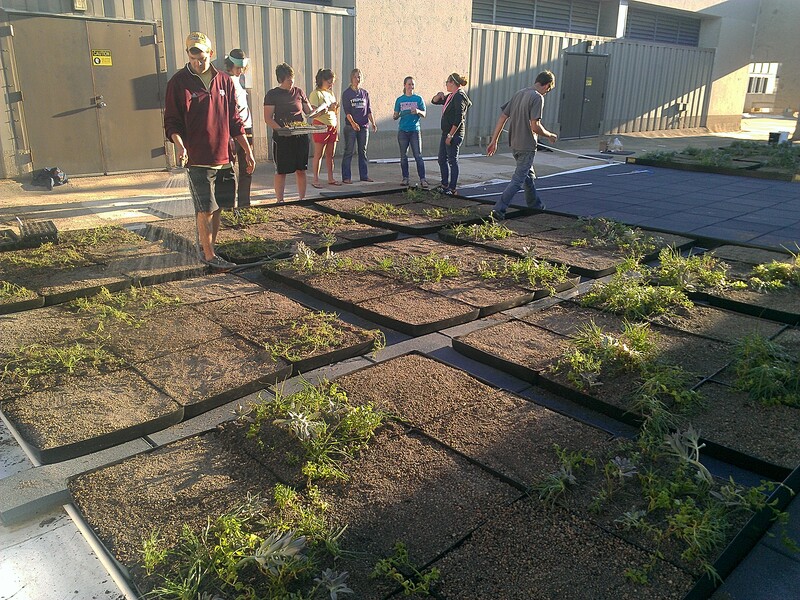 The greenroof project has been been a ton of fun, and I’ve learned a lot. I got the opportunity to use and see lots of really cool scientific equipment. Getting my hands in the dirt, or the lab, was a great learning environment. I’m now confident that I could build a greenroof without instruction, and understand the science behind its environmental benefits. One interesting potential environmental benefit, that Dr. Dvorak informed me about, is the potential for greenroofs to serve as a biogeographical corridor. A corridor is a strip of habitat that connects ecosystems on a fragmented landscape. They can be important in preserving biodiversity. Widespread adoption of greenroofs in a city, or on a campus can grant insects, like butterflies, a new geographical route across urban regions. I thought this perk was really cool, and made a lot of sense. it becomes clearer how much good these gardens may do. Urban regions exact a heavy toll on the environment by transforming it so radically. An entire swath of plant life is transformed into cement. We are beginning to realize some of the effects of this transformation. The urban heat island effect, habitat fragmentation, and reduced absorption of greenhouse gases are a few. I’m guessing we still don’t know many of the effects the lack of vegetative cover has, however, I do know a safe non-risky solution; greenroofs, lots of them. Large scale greenroofing, across a campus or urban region, is a risk-free and fun way to mitigate the risk associated with urban land-use change. They allow urban areas to benefit from natural processes, rather than being blocked from them. The vegitative cover could raise an urban area’s albedo, absorb CO2, cool our buildings in the summer through transpiration, insulate them in the winter, and increase local biodiversity. Greenroofs are pretty to look at and fun to construct, this makes them a superb tool to bring cities and campuses closer nature. I want to thank Dr. Volder and Dr. Dvorak for coming up with the idea, getting the grant to make it happen, and including me on this awesome project. I also want to thank Kirk for all his hard work and dedication, and for being great at communicating with students and organizing people. Hope everyone has a fun, safe, and peaceful winter break!